Our granddaughter Kristen was our inspiration for this soap that boasts a fruity blend of pears and berries. This is one of our fruitiest and one of our most popular soaps. This is our line of “Scändic Soaps”. 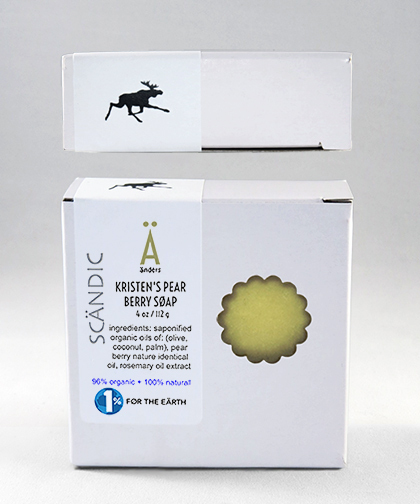 They were formulated using mostly sourced Scandinavian ingredients. They were all given product names of Nordic origins. They contain pure therapeutic grade essential oils (some are organic) along with a nature-identical oil, and natural ingredients like: organic oatmeal, sea kelp, Icelandic moss etc. We use extra virgin organic olive oil (EVOOO) as the base oil, along with the extra virgin organic oils of coconut and sustainable palm. We use rosemary oil extract (ROE) as a plant based natural preservative. Many of the products contain botanical ingredients derived from the Nordic regions of Norway, Sweden, Finland, Denmark and Iceland. We make all of our soaps using the cold process method of manufacturing. This insures that the soap creates its own natural glycerin and the essential oils effectiveness is retained (by far the best soap making method). All of our soaps are completely safe to also be used on the face. Many people also use it to wash their hair, and many men use our soaps to shave. The soaps are hand-wrapped in recycled paper with a round label attached. Our base oil is used at a very high percentage of the mix. This beautiful oil is from the olive fruit using cold press extraction and decanting methods. Extremely beneficial for the skin, olive oil contains high levels of vitamins A & E, oleic acid and antioxidants. It also makes a great carrier oil for use with any essential oils. Our premium grade organic extra virgin olive oil penetrates deep into the skin, providing needed moisturizing as well as a shield to protect the skin, keeping it smooth, and due to its high level of antioxidants A & E, it can repair skin damage from sun exposure, cigarette smoke and pollutants. The palm oil that we source for our soaps is “Certified Sustainable Palm Oil” (CSPO). This oil is produced on palm plantations that have been independently audited and found to comply with the globally agreed environmental standards devised by the Roundtable Sustainable Palm Oil (RSPO). Palm oil is derived from the pulp of the fruit of the palm tree. It is red in color due to its high beta-carotene content making it high in antioxidants and extremely good to use in skin care products. Palm oil is good to use in soap as it gives hardness to the bar making it last for a longer period of time. Rosemary Oleoresin, also known as Rosemary oil extract or ROE is an oil soluble, natural extract of the leaves of the rosemary plant used to retard rancidity in natural oils. Its potent antioxidant properties are attributed in large part to carnosic acid, one of its major constituents. ROE is 100% natural and is the most effective natural preservative to be used in the manufacture of cold process soap. To keep your bar longer, keep it dry between uses. We recommend that you try one of our soap dishes or buy a dish that drains the bar well. Enjoy your soap and just a bit of information, most of our customers say that our soaps usually last approximately one month per bar.